Think of your current headset, now imagine lighter, more comfortable with a system better ventilation ..
Building on a long tradition of innovation, Lazer decided to combine all the elements of a high performance helmet and push each feature as much as possible. 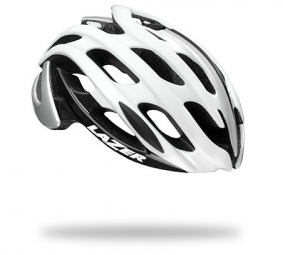 It is the lightest helmet Lazer never without sacrificing style, safety or comfort. Styling wise, he has the look of a contemporary high performance road helmets with built wing on top of the helmet.